It's Grymn Out There. : Having an Identity.. There are a number of reasons that I have chosen the system above but the most important one is availability of decals. 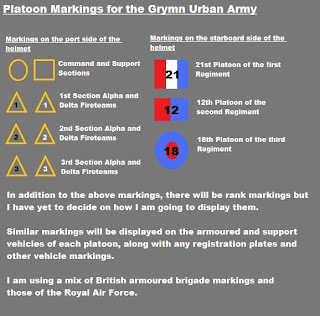 The yellow markings are the same as WWII British armour markings and the the regiment markings are the same as those on Royal Air Force aircraft. The beauty of choosing these is that they are available in a range of scales so I can choose the right decals for both marking up they helmets and the various other bits of kit for the army. As a result, I have just ordered a selection from Dom's Decals so when they arrive, I will be able to review them. I still need to source some numbers but I can do that at a later date (because I may need to make further orders to get exactly the right sizes). Thinking of platoon markings has kept me busy in between putting together the units. I have been building units in line with an earlier POST that details the break-down of each section in to its component parts. It consists of the Platoon Commander, a Communications Officer and a couple of light infantry troops that will have leader ranks (a Staff Sergeant and Sergeant...probably). 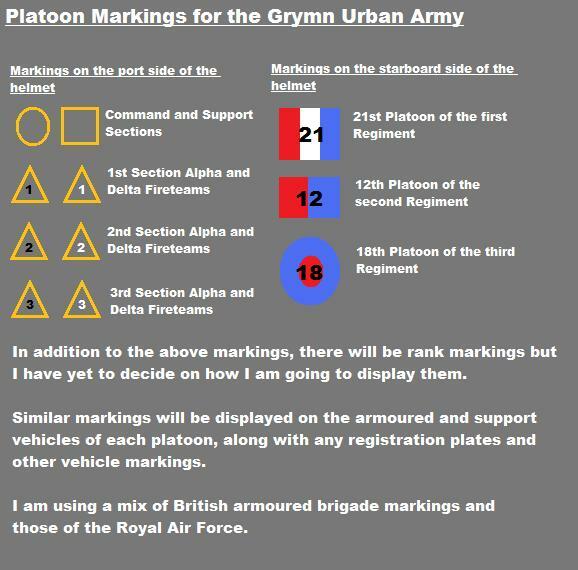 I am yet to decide upon a set rank structure at the moment so I will be using a few army ranks to represent the ones I haven't thought of a name for at the moment. It consists of a Sergeant, a light infantry soldier with a one-shot rocket launcher and a pair of light machine gun (LMG) gunners. This unit is designed to work in unison with the Command Section and act as the second fire-team if required. Although there is a one-shot rocket-launcher in the team, for game purposes the support section's weapon will have unlimited shots because they will have extra loads aboard their transport and would be aided by the Command section when reloads are required. As you can see, I have not added markings (they haven't arrived yet) but the army is well and truly started. I have two more fire-teams on the table (for the first infantry section) and in the process of paint. I will be using the test models as part of the teams so I only need to paint six troopers to finish the section. Remember that an infantry section has eight members (two fire-teams of four) instead of the four members that the Command and Support sections have. I will be trying to decide upon rank structure next.